Chigeza, Philemon, and Whitehouse, Hilary (2010) Australian Torres Strait Islander students negotiate learning secondary school science in Standard Australian English: a tentative case for also teaching and assessing in Creole. 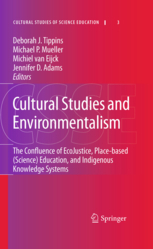 In: Tippins, Deborah J., Mueller, Michael P., van Eijck , Michiel, and Adams , Jennifer D., (eds.) Cultural Studies and Environmentalism: The Confluence of EcoJustice, Place-based (Science) Education, and Indigenous Knowledge Systems. Cultural Studies of Science Education, 3 . Springer, London, UK, pp. 415-437. [Extract] At the opening of the 42nd Australian National Parliament in early 2008, the Prime Minister of Australia, Mr Kevin Rudd, pledged to build new educational opportunity for indigenous children of Torres Strait Islander and Aboriginal descent. The discourse used was that of "closing the gap" on both opportunity and academic achievement. The persistent difference in educational achievement and attainment between indigenous Australians (Aboriginal and Torres Strait Islander people) and non-indigenous Australians (immigrants to the continent since 1788 and their descendents) is a problem with many complexities, including tolerated failure on the part of state and federal governments over many decades to vigorously address persistent educational disadvantage. Australia has been described as a "high quality-low equity" country in that Australian schools, while operating under high-quality policy frameworks, have found it difficult to address equity issues in teaching, learning and assessment effectively in practice (Klenowski 2009).